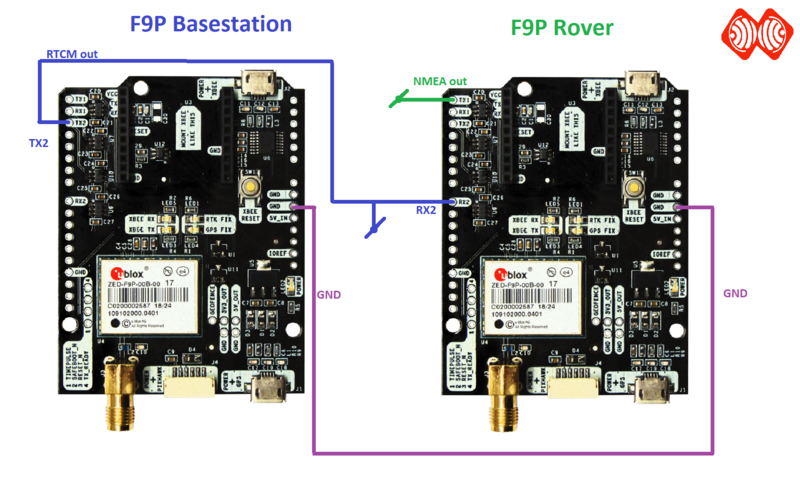 To connect two f9p boards together as base and rover, do we simply connect rx2 to tx2 and vice versa between the two boards? Do we also need to connect the two IOREF’s together? To monitor the communications, can we also connect the rx2 and tx2 to serial inputs on the desktop, and simply run cutecom (for example) to watch these sentences as they happen? You can aslo just connect TX2 (Base) to RX2 (Rover) is enough for RTK tesing. Make sure you also supply IOREF, otherwise the UART pins will not be active. IOREF: this is an input that will define the voltage levels of the next pins. If you input 1.8V, the next pins will be 1.8V level. It supports from 1.2V to 5.5V. If your are connecting your own hardware to UART1 or UART2, it is mandatory to connect IOREF pin to the voltage required by your hardware, otherwise you may experience problems. Ah, thanks Ardusimple. i miss it. Thanks. I assume the little “handle” on the blue line is for connection to a computer to monitor. Is there a table somewhere that specifies the suggested outputs from the base to the rover? Is there no need for feedback to the base from the rover? Think I’ll try to use a couple of UNO’s as serial to USB translators to send the data to the monitoring computer. Was hoping to stay away from soldering. 🙂 Just gotta unsolder everything later after the tests are finished. We do not need any feedback from Rover to Base.